I went to Thacher. The fall of 1984 was my freshman year. I lived in Lower School, which was the old Lower School. 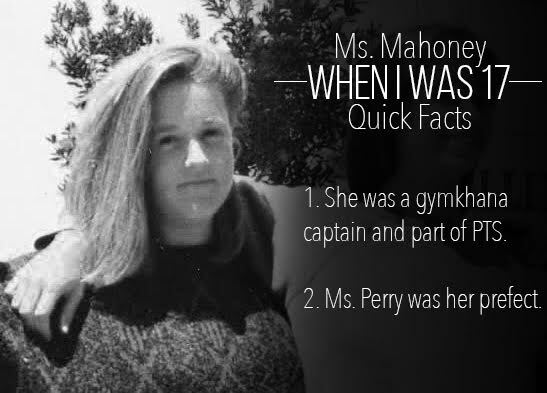 Ms. Perry was my prefect. The school was different since we didn’t have all the buildings we have today but we had the same number of students. All the freshman rode. Later, I was gymkhana captain, co-captain and I was also part of PTS. Before coming to Thacher, I had planned to run track and I also wanted to ride. But I didn’t end up running track. There was not a sports requirement at that time, so I rode Western and English for all four years. Then I also played sports, mainly lacrosse. No, I didn’t imagine myself as a teacher. I loved art and horses, so I always knew I would do something with art and horses. After college, I ended up riding professionally and showed my art in galleries. At my ten-year reunion, Mr. Mulligan asked me what I was doing in life and if I was interested in helping out in the horse program. After two years of being in the horse program, the art teacher quit, so I stepped into the role of art teacher. But I had not predicted all that. As stressful as it can be, try to balance having fun with your friends and enjoying your classes with the stress of getting things done and doing well. Try as much as possible to enjoy learning for learning’s sake. Get involved with things you haven’t tried and find out things you didn’t know you would like. This is the time in your life to do that. My senior year, my parents took a trip to China and invited me to go. I was one of the top three gymkhana riders and would have missed my last gymkhana. I turned down the trip to China, and I regret that. On April Fools’, some kids wanted to put a horse in the study hall. But the horse wouldn’t go and it finally got loose from them and started running around campus. Another thing was, my English teacher at that time, his best friend was this actor named James Spader (he’s on The Blacklist). I was giving an oral report in class, and he walked into the classroom and sat down. I totally fumbled everything. I was like, “Oh my gosh, James Spader is sitting in the room!” I messed up everything up and basically started giggling and sat down. There were other embarrassing moments I can’t recall now, mostly because I’ve blocked them out.